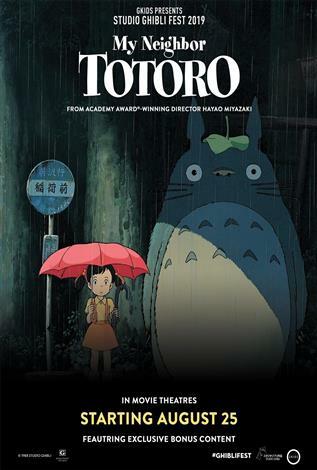 One of the most endearing and internationally renowned films of all time, a film that Roger Ebert called “one of the five best movies” ever made for children, My Neighbor Totoro is a deceptively simple tale of two girls, Satsuki and Mei, who move with their father to a new house in the countryside. They soon discover that the surrounding forests are home to a family of Totoro’s, gentle but powerful creatures who live in a huge and ancient camphor tree and are seen only by children. Based on Miyazaki’s own childhood imaginings, Totoros look like oversized pandas with bunny ears and they take the girls on spinning-top rides through the tree tops and introduce them to a furry, multi-pawed Catbus — a nod to Lewis Carroll’s Cheshire Cat. English subtitles.